I left the house just after sunrise and there was still mist hanging in the hollows and over the canal. On the train heading north the skies soon became blue although cloud and showers are forecast which reduces my anxiety about leaving the greenhouse unattended for a few days. At Warrington, a young couple from Liverpool got on the train and sat opposite me. He was going to treat her to a meal at The Kitchen restaurant so she was checking the menu on her phone. This required some assistance with translation – what is a hogget? Answer: a young sheep between one and two years old i.e. older than the lamb usually eaten. We passed Steven’s Croft, the largest biomass power station in the UK with many piles of wood lying around it. The snow seen two weeks ago has disappeared from the hills and the River Clyde was running fairly high. Ploughing has begun but many of the upland deciduous trees are still without leaves. We arrived at Waverley on time and as I walked over to the Mound to catch my bus noted that Princes St Gardens have now been re-turfed and the tourist season is well underway. Back in the flat the cherry trees are coming into leaf. I’ve got plenty of housework, essential shopping and the Scottish Arts Club AGM to keep me occupied for the next couple of days. 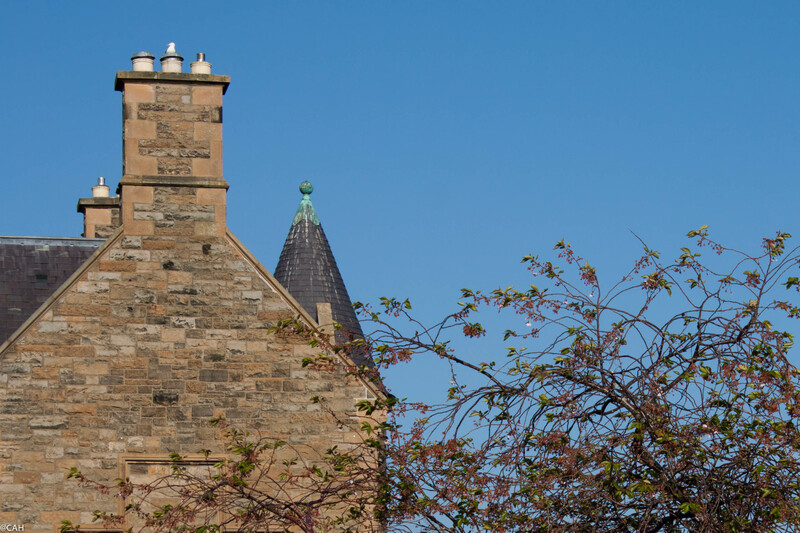 The chimney and turret of Esdaile are a regular perching place for gulls.